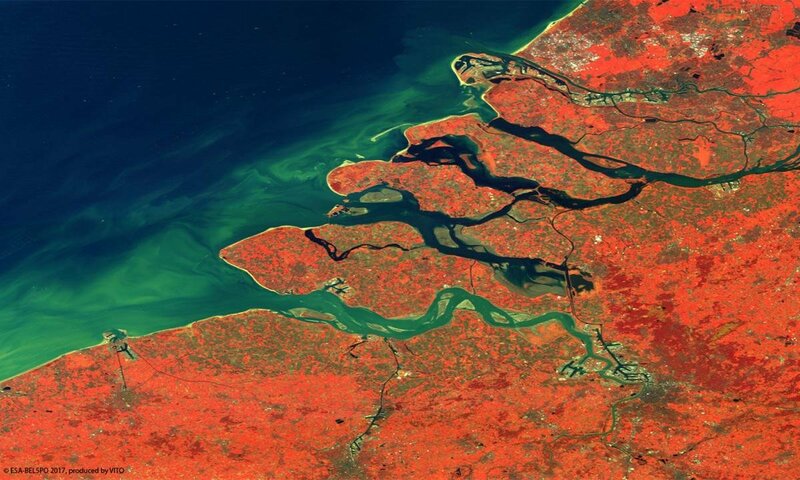 On 4th December 2016, PROBA-V captured this beautiful 100 m false-colour image of the estuaries of the Scheldt and Rhine rivers along the coast of Belgium and the Netherlands. The ports of Rotterdam in the north and Antwerp, along the tidal Scheldt river in the south, are two of Europe’s busiest harbours and gateways into northwest Europe. In between the two main shipping routes of the delta, basins like the Eastern Scheldt remind us past connections between the rivers and the North Sea. The Dutch Delta Works, recognized as a marvel of modern Civil Engineering, protect inland areas from flooding through various dams, sluices, dykes and storm surges. The smaller port of Zeebrugge, to the east, along the coast and the inland harbour of Ghent that is connected to the Scheldt river by a canal, are visible as well.